Featuring the man who beat Ronnie Coleman and Jay Cutler at the 2005 Olympia Challange round - IFBB Pro Gustavo Badell! Watch 2006 San Francisco Champion and 2005 Mr. Olympia Challange Round winner Gustavo Badell workout in his new home town Las Vegas. 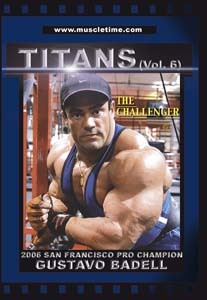 Footage was taped 2 weeks out of the 2006 Arnold Classic. Full body workout and bonus footage - in his new house, onstage at the GNC and backstage at the Arnold. A Muscletime Production. Running time: Approximately 122 minutes; Widescreen; All Regions, NTSC.